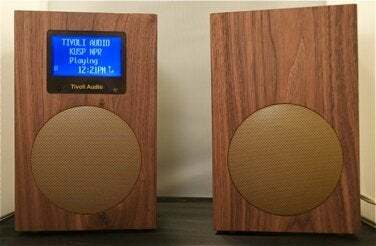 Tivoli Audio, makers of some of our favorite portable radio and iPod speaker systems, has taken the next logical step in streaming audio: Internet radio and LAN streaming. It has done so with its distinctive-looking lineup of NetWorks radios, all of which stream audio from the Internet or any computer on a local area network, as well as play audio from a USB drive or an analog audio source (but, regrettably, not from an iPod connected via USB). Higher-priced models—one of which I examined for this review—also include FM radio and a second speaker. At a list price of $750, the FM stereo version of the NetWorks radio isn't cheap, but for that price you get a flexible system that nicely fills a room with sound. When I say the NetWorks radio is “distinctive looking,” I suggest that people will likely have strong feelings about its appearance—positive as well as negative. The cabinets are made of walnut, cherry, or wenge (a dark tropical hardwood), and the speaker grill is a flat gold color. These speakers make a design statement that some will find a refreshing change from the white, black, or silver tone of many of today’s speakers. Others, however, may be reminded of the wood paneling applied so freely in the 1970s. You can't ignore the NetWorks radio's hardwood cabinet. Though some may think the radio’s wooden appearance cheapens the look of the speakers, few would argue that Tivoli Audio skimped on the sound. For its size, the NetWorks radio puts out a significant amount of quality audio—including plenty of bass. In fact, perhaps more bass than you might like; I found it a little muddy. Fortunately, the radio includes a configurable EQ feature for adjusting the bass and treble levels. 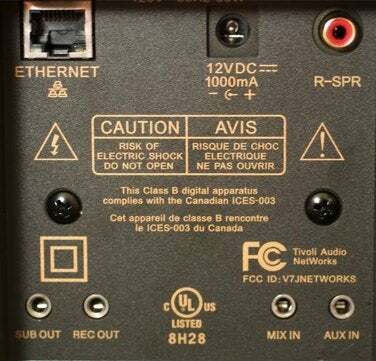 The stereo NetWorks radio I examined is composed of a base unit and a tethered right speaker (you can easily disconnect the second speaker by unplugging its cable from the base unit). This base unit is 5.5 inches wide, 8.75 inches tall, and 5.12 inches deep and hosts the system's amplifier; a blue backlit LCD for navigating through the radio’s controls; input and output jacks (headphone, right speaker, line-level, and subwoofer outputs, and auxiliary and mix inputs); an Ethernet jack; a balance knob; a USB port; control buttons on the back; and a dial/button on top that you use to adjust volume or mute the radio. The FM model also includes a telescoping antenna. The base unit also includes a subwoofer port for those who’d like to add an optional subwoofer. 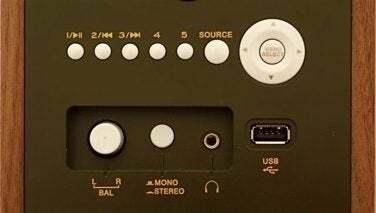 There’s a button on the back that lets you choose to play the base unit alone as a mono speaker or, when adding the second speaker, the two speakers in stereo. If you don't need stereo audio, the base unit can be had for $600 without FM radio, or $650 with FM. The aforementioned backlit LCD is what you use to select the wireless or wired Internet connection you’d like to use; choose a source for music files stored on networked computers or an attached USB device; tune in local FM stations; and configure the radio’s alarm and sleep features. You can do this in league with the included remote control or via buttons on the back of the base unit. The back of the NetWorks radio. As with the less-expensive Aluratek Internet Radio Alarm Clock, it takes a fair amount of fiddling to configure the NetWorks for Internet radio. You can seek stations by location or genre, and you can search for stations by their call letter or a keyword—chill, for example—to pull up a list of stations whose names or descriptions contain that word. But because the remote doesn’t include an alphanumeric pad, you have to enter call letters or keywords with the remote’s arrow buttons, navigating through a list of letters. It’s a bit tedious. The list of Internet radio stations is provided by Tivoli Audio. Luckily, you’re not stuck with just the stations available when the radio was manufactured. You can send an e-mail message to Tivoli Audio requesting that they add stations not included with the radio. Alternatively, you can go to the company’s Web site, register your radio’s ID, and request that specific stations be added just to your radio (you need the station’s ID and URL). Tivoli Audio processes that request and adds the requested stations to a My Stations listing on your radio within 24 hours of the request. Also, because the radio has the ability to update its software, Tivoli can add other stations along with those updates. If you don’t use the search feature and prefer to browse for stations, you must dig down through several layers of menus to find the stations you’re after. And you’ll need to be close to the radio to do this—the blue LCD display looks cool, but it’s difficult to read from a distance. Being able to configure the radio from a computer on the local network or, say, an application running on an iPhone/iPod would be very helpful. The bottom of the NetWorks radio. Once you find an Internet station you like, you can assign it to one of five presets, accessible from the remote or the preset buttons on the back of the radio. You can also add as many as 200 stations to a favorites list. You can save up to five FM stations to the remote’s presets. Doing so won't overwrite Internet radio stations you've saved to those buttons; the remote is smart enough to maintain separate presets for Internet radio and FM radio. Which you hear depends on the audio source you’ve chosen on the radio—Internet radio or FM. A Source button on the remote or on the back of the base unit allows you to easily switch between sources. It’s useful that you can stream audio files from computers on your local network and play music from attached USB drives, but I’d like to see these features enhanced in a future version of the radio. Currently the NetWorks radio can stream only MP3 and WMA files. AAC files, protected or not, aren’t supported, so if you’ve ripped CDs using iTunes' default settings or purchased music from the iTunes Store, you can’t stream that music unless you convert your audio files to MP3. Confusingly, albums and playlists that include AAC files still appear in the interface—it's frustrating when you believe you can play them and then discover you can’t. For some, the look of the NetWorks radio will make or break the sale. It’s a unique look that not everyone will appreciate. If you get beyond that hurdle, you’re looking at a capable, reasonably portable, but pricey (at least $600) music player that can stream Internet radio and some music from your networked computers, play music from some attached USB devices, amplify devices (including iPods) plugged into its auxiliary jack, and, with some models, play FM radio. While I admire its flexibility and, generally, its sound, I regret that it requires some work to configure and navigate.